I had to move my refrigerator this morning because I dropped a knife behind it. Let me tell you, it's not the kind of task you want to have to do when it's 8:30 in the morning and you've slept for maybe four hours. All in all, it was surprisingly easy. Then again, perhaps my superhuman strength accounts for that. 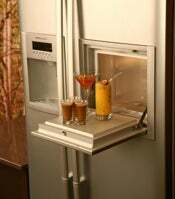 So when you ask me what technology I'd most like to see in a next-generation fridge, I might very well say "anti-gravity." If that's not available, I'll settle for an integrated bar. There, LG can help. Open up the integrated door in the front of their Side-by-Side Bar Fridge for immediate access to all the fixin's for your favorite drinks. Of course, there's also the traditional ice cube/water dispenser, which is super handy for mixing drinks. And for the truly dedicated, feel free to fill the water dispenser up with your favorite vodka for a fun holiday treat.